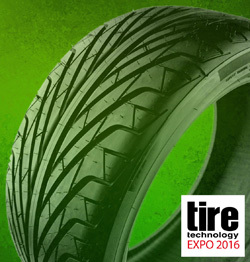 Visit stand 4007 to meet TARRC’s team at Tire Technology Expo 2016 in Hannover, Germany. We shall be showcasing Malaysia’s sustainable, low carbon footprint speciality NR material, EKOPRENA. EKOPRENA/silica compounds have been developed by technologists at the Tun Abdul Research Centre (TARRC, the UK-based research and promotion centre of the Malaysian Rubber Board) and are being commercialised for use in tyre applications. To prebook an appointment with Dr Stuart Cook, TARRC’s Director of Research, please contact Gail Reader, greader@tarrc.co.uk or call +44 (0)1992 584966 ext 2079. TARRC will also be giving three papers at the prestigious accompanying conference in Hannover. Dr Anna Kepas-Suwara will be giving a paper on ‘Morphology and nanomechanical properties of NR blends’ on Tuesday 16th February at 4pm. Paul Brown will be giving a paper on ‘Epoxidised natural rubber in retreaded tires’ on Wednesday 17th February at 2.50pm. Dr Pamela Martin will be presenting her paper ‘An inside view of silica-filled NR for tread applications’ on Thursday 18th February at 9.50am. Please take a look at the Conference Programme for more details. TTE offers the visitor a technology showcase covering materials and equipment through the complete spectrum of the tire design and manufacturing process. TTE also offers visitors, exhibitors, and conference delegates an unrivalled networking opportunity within the tire design and manufacturing sector.